* Special edition linen cloth (hessian, "hardcover"-book style) sleeve with ribbon-tie. ** In "double" (plastic) cassette case with full artwork, and gatefold inserts matching album graphics. Cassettes (and labels) identical to "boxed" version. Paper stock varies from grey to brown(ish). 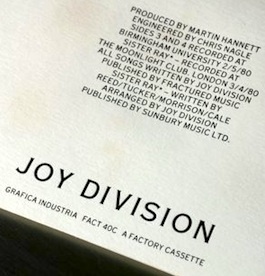 **** Recorded live Birmingham University [2 May 1980], Joy Division's last performance. ***** The run-out grooves reference (the chicken in) Werner Herzog's film 'Stroszek'. (1) White engraved lettering on the front and back covers, and a Garrod & Lofthouse imprint on the back cover. (2) Regular version without embossing and without the Garrod & Lofthouse imprint. (3) White sleeve w/ blue lettering, with labels to match. As for all 'Still' LP and CS releases worldwide (excluding the black label Italian edition) the sleeve track listings mistakenly omit "Twenty Four Hours".